White Water Rafting Cairns - View all options here. 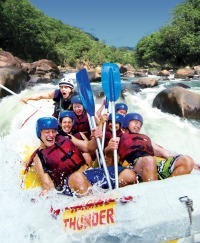 White Water Rafting is one of the most popular adventure activities in Cairns. 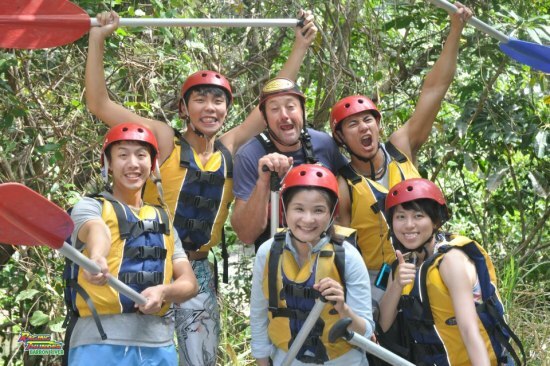 Not only does it provide adrenalin pumping action, but where better to get your thrills & spills than amongst pristine World Heritage Rainforest. This unforgettable backdrop is well worth the experience in itself! 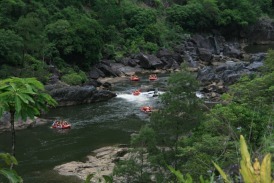 There are two main rafting rivers in Cairns - The Tully and the Barron River. The Tully River is a full day trip with rapid grades ranging from 1 - 4. The Barron River is a half day trip more suited to beginners, those who are a little less confident in the water, families, or those short of time. We have the best climate, weather, and with the Barron and Tully both being Hydro release rivers, water levels are guaranteed year round. 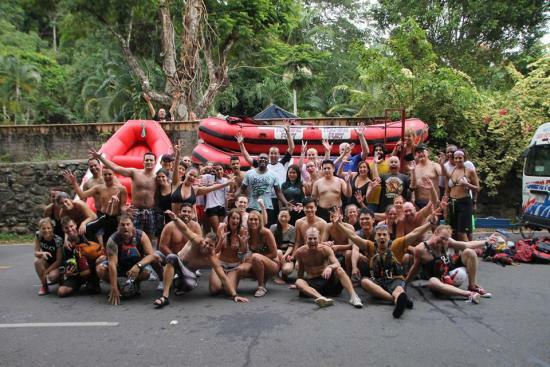 Most Rafting Tours in Cairns ask customers to pay a Levy on the day of travel. This is usually made up of insurance & Environmental Management fees. This "Pay on Day" fee is also used by some Reef & Tandem Skydive Operators. 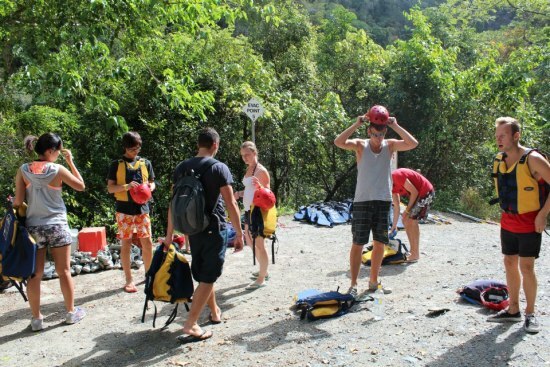 For example: You might see a Tully River Rafting tour from Cairns advertised for $169 + $30 Levy payable on the day. To make things easier & save confusion we include the levy in our advertised prices. We advertise the Actual Rate so when you book with us there is no more to pay on the day! 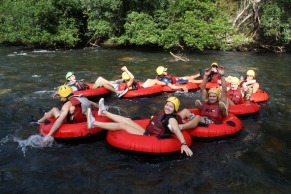 There are 2 main rafting rivers in Cairns - the Tully and the Barron River. The Tully River is a full day trip with rapid grades ranging from 1 - 4. The Barron River is a half day trip more suited to beginners, those who are a little less confident in the water, families, or those short of time. 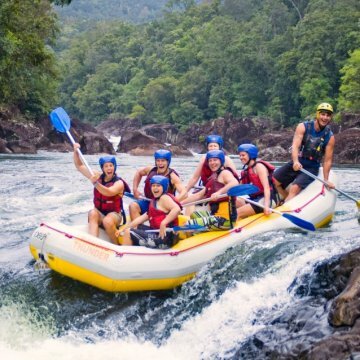 The Tully River is regarded as the best white water rafting experience across Australia and New Zealand, offering 5 hours of action-packed rafting on grade 3/4 rapids. For the more adventurous rafters, step up to the Xtreme Rafting or Rapid Boarding on the Tully River. These small, exclusive trips will take you on the WILDEST white water ride possible! 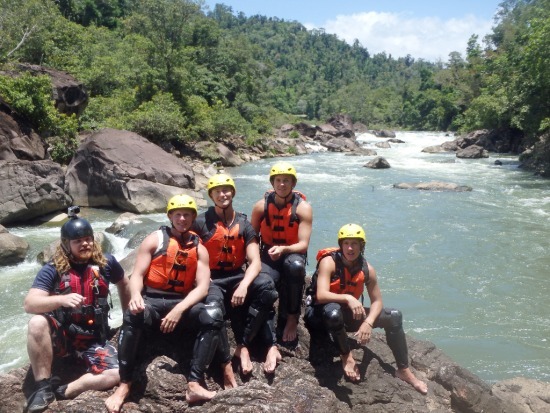 Far North Queensland is an awesome place to go rafting. We have the best climate, weather, and with the Barron and Tully both being Hydro release rivers, water levels are guaranteed year round. White Water Rafting also provides a great opportunity to view World Heritage Listed rainforest from a different perspective. 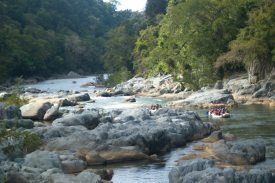 Barron Gorge National Park and Tully Gorge National Park are both situated within the Wet Tropics World Heritage Area, meeting all four natural criteria for World Heritage Listing status. Your guides are environmental stewards who will share an appreciation for the importance and exceptional natural beauty of this region. You will definitly get wet so bring your swimmers, ideally board shorts are recommended and make sure you wear secure footwear such as running shoes or sandals (that you don't mind getting wet). Cameras, watches and jewellery should be left behind otherwise there is a high chance of losing them if you fall out the raft. Professional photos are taken during the day available to purchase on a USB stick, so you can show off your hero shots to friends and family. Go Pro helmut mounted video cameras are also available to hire so you can keep the memories in real time action. 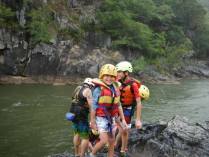 The rafting guides add to the adventure providing heaps of laughs and entertainment along the way. A lot of people who might be a little afraid on signing up find that they have the best time ever! It's very rewarding and all the family can take part. The guides go through rigorous training and are very experienced, they provide lots of fun but at the same time are capable and expert in what they do. All river guides are trained in first aid, CPR, river reading, river navigation and white water rescue. Guides receive regular ongoing river training and assessments to maintain their existing high standards. All guides carry safety equipment to deal with any situation, and life jackets are helmuts are provided to all rafters. Only the world's finest rafts are used. These heavy duty inflatable rafts can seat 6-8 people, they are easily maneuverable and high-performance, providing an exhilarating whitewater ride like no other! On the Tully River you will get to make friends pretty quick. You and your group work together to navigate the river. Everyone paddles whilst your guide shouts out instructions such as BACK PADDLE, BACK PADDLE!! or LEAN IN, LEAN IN!! No doubt at some point along the way you'll get to practice the 'Wild Thing' manouvre which is a technique for freeing a boat hung up on a rock. Everyone on the raft starts jumping around like crazy people in order to break it free! Each river has its own story behind the rapids, some are very valid stories such as the Car Port Rapid - this was named after a series of Liana vines on the right-hand side of the river years ago that used to form a little cavern that you would line up the boat and pass through, hence the name 'Carport'. 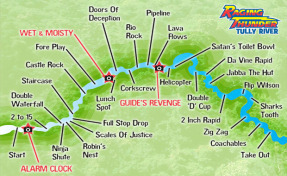 Others have descriptive names such as Cork Screw Rapid which has a corkscrew effect on the raft at the bottom. Practical names include Junction Rapid and Zigzag Rapid. Other names are a little less fortunate such as Two Inch Rapid - named after a trip leader on a cold day, a VERY cold day. Shaun was trying to impress 6 lovelies onboard, he'd tried everything from the superhero manual, nothing was working, so he decided to guide the raft from outside the raft. During this rapid his shorts were lost, and the rapid was named after he rejoined the raft!! The top section on the Tully River has the grade 4 rapids such as Alarm Clock, Theatre, Staircase, Wet n Moisty and Corkscrew. The middle section features grade 3 rapids such as Lava Flow, Cardstone Wier, Double D Cup and Jabba the Hut. The bottom section is mostly grade 3 rapids also such as Flip Wilson, Shark's Tooth, Zig-Zag, Yankee's Pass and the beautiful Maze Rapid. All the fun is in entering these rapids from the front left, right and backwards!! If you're wanting to kick back and enjoy a relaxing float with all the family then River Tubing on the Mulgrave River is the ideal fit. You can even bring some snacks along so you can eat while you drift! 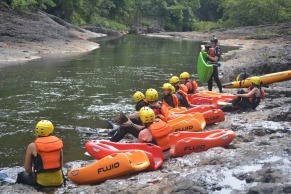 The Barron River Family Rafting with Foaming Fury has been designed for family adventures in mind. Kids from 6 years will have the opportunity to tackle some gentle rapids or jump in and have a go at rock jumping! Children 10 years and above can take on the challenge of navigating their own raft in a 2-person sportsraft. 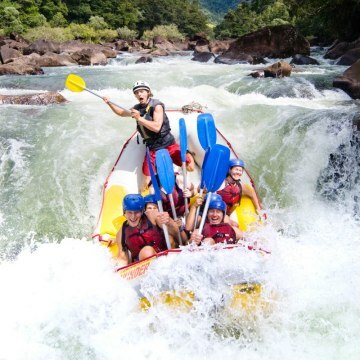 If you're after an adrenalin pumping adventure, then the Tully River is where the action takes place. This is a full day trip departing at 6:00am and returning 6:00pm approx. 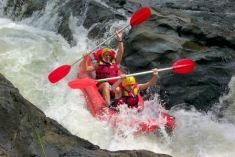 Highly recommended is the Xtreme Rafting, this exclusive tour is a small personalised trip, restricted to only 24 people. Because this is a small trip it can move down the river much faster, so there is more time to do fun stuff such as rock jumping, swimming the rapids, raft surfing! 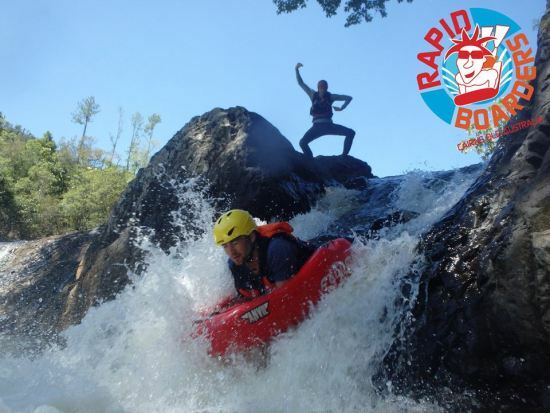 If the idea of rapid surfing gets you excited then join Australia's only river boarding experience with Rapid Boarders. This is an adventure of a lifetime! 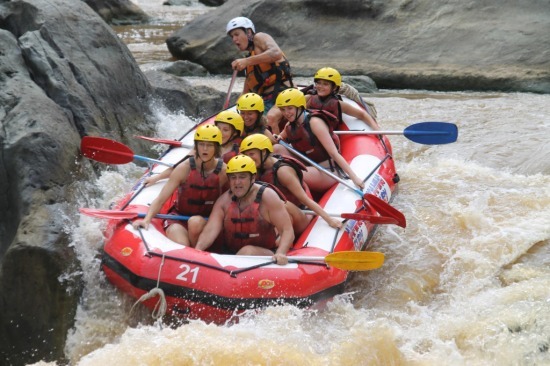 Limited to just 12 people, you will get to navigate and face grade 2-3 rapids rapids head on! World-class specially designed river-boards are used, and life jackets, helmets, wetsuit pants, knee/shin guards and fins are all provided. 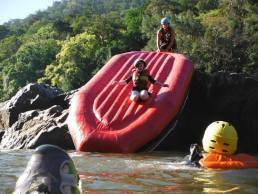 If you're looking for a fun, intense river activity, then do this!! Best trip ever! We have crafted five different rivers and this was the best by far. I highly recommend this. This was my second experience with Raging Thunder (1988 & 2015). Still a fantastic day with friendly, experienced guides, a great lunch and the photos are always fun to look at. My overseas visitors & I all had a great day with a lot of laughs & memories. Thanks Fisherman! This was our highlight after 3 weeks in Australia. We had done almost everything but the scenery, the organization and the great energy ( and professionalism) of the guides made it UNFORGETTABLE. I will recommend this to every one! At 68 and over weight,and not as agile as I could have been, I thought I might have been a bit passed it, but everyone was terrific. No one made me feel out of it, or a burden. What a wonderful experience. Thanks team! Would defiantly recommend doing this tour over the normal Tully River one if you like adrenaline. If your lucky enough to get Rod as a guide you're in for a great day. Expect a few bruises :o) having done the other tour before this was 100 times better, small numbers and heaps of extras. Go do it!! One of the highlights of my life. Absolutley the scariest and most fun activity. Great way to see the rainforest and push your limits. The guides were very good at their jobs, and knew exactly what they were doing. Perfect. This was the highlight of our holiday. Reccommend it to anyone that enjoys a rush of adrenalin. The Raging Thunder crew were FANTASTIC. Would definately do this again. A fantastic day out the rafting crew made the day. A flawless day. It makes me want to do more rafting. This was fantastic the crew that work here are just fantastic!! i had never been rafting before in my life and we chose the extreme trip (which does extra things to the normal group) but it was brilliant i would recommend it to anyone!! We chose tubing beacuse our 11 year old was just a bit too young for white water rafting. Our 16yo thought it was going to be lame. However all of us had a ball and really did not want the day to end. staff were friendly, relaxed and knowledgable which just added to the fun day out , no stress day. We had an absolute ball! A great way to unwind and take in the views while still getting adrenalin surges!! This was a fantastic experience! The staff are friendly, helpful and informative. The location was beautiful and we had so much fun! Highly recommended!This is the best tour I have been on ever, will definitely be recommending to my more adventurous friends! Very highly recommended! Loved the experience, the guides were fabulous. Would highly recommend the Barron River Rafting. We had a fun afternoon of rafting in perfect conditions. The guides were very professional and thorough in their instructions, but lots of fun as well. Roddy & Dan were standouts! The only downside was the time spent waiting around between rapids, but all in all a good time. As fifty year olds we had a ball. The guides were clear to understand. Very capable in their jobs, making us feel 100% safe. And the interaction with the other people with good nature made us refer this experience to every one down here. An absolute thrilling experience. Will remember it for a lifetime! 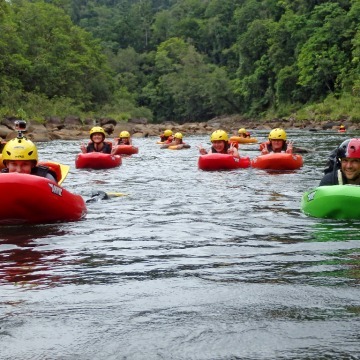 If you're spending a few days in Cairns then why not combine your rafting trip with a reef trip, island trip or other adrenalin fuelled activity. Packages offer great savings and we can even help book your accommodation too. 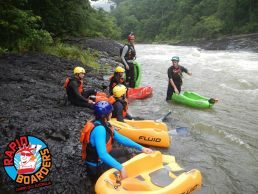 If you're short of time then we have many packages combining Barron Rafting and other adventure activities in one day. Feel free to contact one of our friendly consultants to discuss your requirements. We also specialise in group bookings and team building, and can help make arrangements for your club, workplace, special occasion or school.